Gibson boss says Onkyo set for 'major step forward' | What Hi-Fi? Having made major investments in Onkyo and Teac, Gibson is set to see the two make major investments in developing new products, with Onkyo set to launch models said to be 'different, more contemporary' as soon as next year. Speaking in New York to US trade magazine TWICE, Gibson Brands chairman and CEO Henry Juszkiewicz (left) said that Onkyo was set to take a 'major step forward in product and marketing to consumers' within the next 12-18 months. Similar plans for Teac will follow later, due to the fact Gibson has only recently become involved with that company. As a result, Onkyo is investing more in product development, with Juszkiewicz saying that 'the fruit of those aggressive R&D developments will come out' in the next year or so. He added that 'We might be able to demonstrate some of this in January', presumably hinting at a CES 2014 debut for new products or concepts. But he did admit that, in the 18 months since Gibson invested in Onkyo – buying 51% of Onkyo USA and around 15% of the Japanese company's shares, making it Onkyo Japan's second-largest shareholder – the pace of change 'hasn't been fast enough for me'. 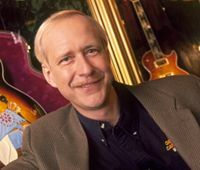 He noted that Gibson, Onkyo and TEAC – 54.4% of which Gibson bought in May – have over 1000 electronic and mechanical engineers, including chip designers, and that Gibson has recently hired a chief technology officer to integrate the engineering and technical resources of the three in Japan. Although hi-fi components remain at the core of Onkyo's offering in most of the world, the company has already shown its ability to move beyond those areas and into new sectors. In Japan it has long produced 'entertainment computers' and tablet devices, and last year moved into the headphone sector with a modular range of designs having interchangeable cables to bring performance upgrades, and has its e-Onkyo music service to sell the high-resolution content its network products can play. At the time of my visit to Onkyo last year we were teased with a slide saying that what was in the future was 'Super Confidential', but we were also shown, and had demonstrated, some concept products showing just how the company views the future of music at home. Details of these products are still under wraps, but while some are clever engineering developments on the kind of products in current Onkyo line-ups, others offered a more radical view of the engineers' take on how music could be enjoyed. As Juszkiewicz has said, those concepts are showing some reluctance to break free from the engineering labs and closed-door briefings, but from what I was shown last year, Onkyo certainly has the wherewithal not only to break into new sectors of the market, but also establish itself as a major player in those areas.